Sophomore guard Paul Jorgensen drives to the basket in the Colonais' win against Army on Sunday. Jorgensen had 2 points in 21 minutes off the bench. 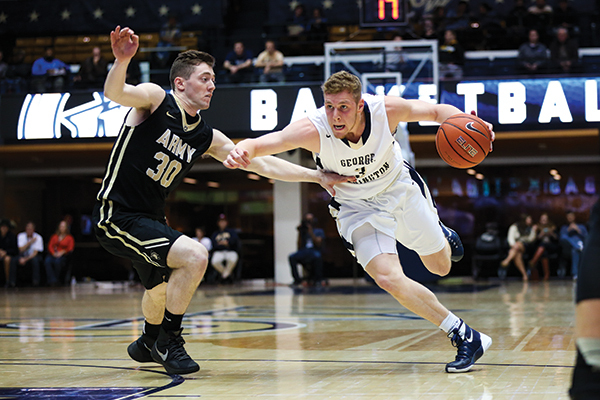 Midway through the first half of GW’s win over South Florida Thursday night, sophomore guard Paul Jorgensen took a shot that, maybe, he shouldn’t have. Jorgensen drove into the paint, an area occupied by three Bulls plus Kevin Larsen, and released a short floater with his elbow bent 90 degrees and his shins parallel to the floor at even height with Larsen’s waistband. Graduate student guard Alex Mitola, a career 38.9 percent three-point shooter, was in the corner with about nine feet of space between him and his nearest defender. Jorgensen still made the shot. Though he’s retained his freshman flair, Jorgensen looks like he has made a leap in the beginning of his second season. Through three games, Jorgensen has doubled his playing time from last season, more than tripled his scoring, eliminated his turnovers and has looked like a critical piece of GW’s offense and an immensely valuable sixth man. He scored 16 points in 19 minutes of playing time Thursday against USF, three days after he put up a critical 10 points against then-No. 6 Virginia by penetrating through the pack-line defense. Statistically, Jorgensen was the most efficient producer on the floor on Thursday night. Off paper, some of his shots were absurd. Late in the second half he got another one when, with five seconds on the shot clock, just when it becomes hardest to make a play, he drove to the basket for a layup and got a goaltending call. Head coach Mike Lonergan said that Jorgensen is the only player on the team built for those situations where he has to create shots by getting by his man, which helped against USF as the Bulls focused on taking Larsen out of the game. Jorgensen was an effective bench producer in his rookie season, averaging 3.6 points in 10.2 minutes per game last year. So far this year, though, after what he called a summer of “nonstop basketball,” he’s played 21.3 minutes per game and is averaging 9.5 points per game. He’s shooting 40.9 percent from the field and is scoring 0.447 points per minute of playing time. The increase in minutes has meant that Jorgensen spends more time on the floor with senior starting point guard Joe McDonald. But far from competing for time or touches, the two complement each other’s games and both say they love playing together. They switched off at the one when they shared the court Thursday night, as they typically do. When McDonald was running the point, Jorgensen was his go-to first pass. Early in the second half, McDonald brought the ball up the court. He motioned to Jorgensen, planted in front of the GW bench, came across the baseline to the other side and passed him the ball. Jorgensen passed back to McDonald and each layer of the Bulls’ zone defense pivoted to key on McDonald, who threw it back to a then wide-open Jorgensen who hit one of GW’s only threes of the night. Having Jorgensen up top helped McDonald collect his game-high 13 rebounds. Aided by some time off the ball, McDonald was the only player with double-digit rebounds aside from USF freshman center Jaleel Cousins, brother of Sacramento Kings star center DeMarcus Cousins, who had 11 boards. But Jorgensen’s defense hasn’t picked up the way his offense has. Sophomore guard and Maryland transfer Roddy Peters drove past him several times and senior guard Nehemias Morillo ran straight through him with 4:04 left in the game to bank one in off the glass and cut GW’s lead to three. Of course, Jorgensen went straight down the other end, motioned for Yuta Watanabe to set a pick and then used it to hit a 17-foot elbow jumper. In some ways, that’s always been Jorgensen as a player, but he is clearly more refined after his first full season of college ball. He has yet to turn the ball over this season, and many of his points depended on court vision and understanding of plays. Some plays, of course, took more of a beg-forgiveness-than-ask-permission approach. But he’d only have to beg if he missed.